City in the old Spanish kingdom of Leon. On March 5, 1152, King Alfonso VII. granted to the thirty Jewish families living there the same privileges which the Jews in the city of Leon had received from Alfonso VI. (Becerro, "Ms. de Sahagun," in Mendes dos Remedios, "Os Judeos em Portugal," p. 118). By the time of Alfonso X. the Jewish community of the city had become one of considerable size, and the question of privileges again arose. On April 12, 1255, the king issued an edict placing the Jews of Sahagun on an equal footing with those of Carrion. They had special judges, who were appointed by the rabbis of Burgos, and who took an oath before the Abbot of Sahagun that they would decide the cases brought before them to the best of their ability, while the abbot had the right to carry all cases on appeal to the rabbis. 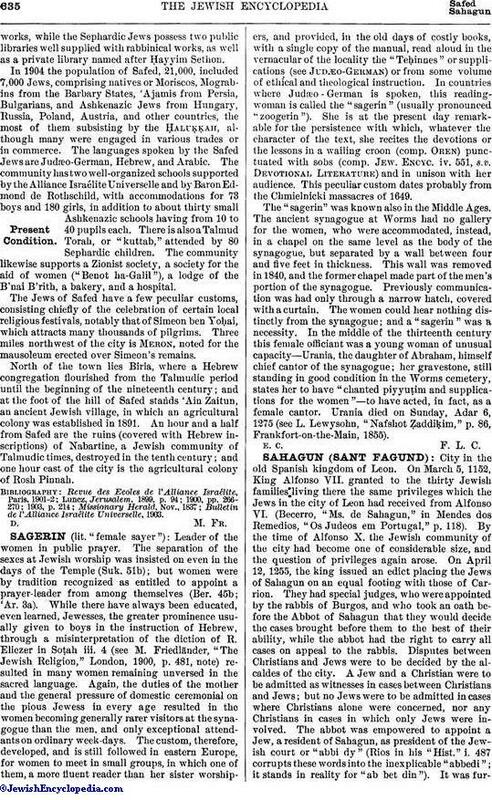 Disputes between Christians and Jews were to be decided by the alcaldes of the city. A Jew and a Christian were to be admitted as witnesses in cases between Christians and Jews; but no Jews were to be admitted in cases where Christians alone were concerned, nor any Christians in cases in which only Jews were involved. The abbot was empowered to appoint a Jew, a resident of Sahagun, as president of the Jewish court or "abbi dy" (Rios in his "Hist." i. 487 corrupts these words into the inexplicable "abbedi"; it stands in reality for "ab bet din"). It was furthermoredecreed that the Jews should pay to the abbot a tax of 18 dineros, and in addition a yearly sum not exceeding 100 maravedis for the maintenance of his table "ayantar," etc. Later, when the abbot extorted various larger and smaller sums from them, imprisoning those that refused to pay, the Jews of Sahagun appealed for their ancient privilege. They laid their complaint before King Henry III., saying that in consequence of the abbot's arbitrary procedure many of their brethren had left the city, and that the remaining Jews were not able to pay the royal taxes. On Aug. 15, 1401, the king issued an order to the abbot forbidding him, under penalty of a fine of 10,000 maravedis, thenceforth to molest the Jews with fines or imprisonment. The abbot, however, disregarded the royal order, and four weeks later (Sept. 18) the king ordered him to appear within two weeks at court to explain personally his reasons for his disobedience. The abbot, however, again disobeyed the royal command and imprisoned, among others, R. Abraham Obadiah and D. Gracia, his wife; the teacher or physician Maestro Yuce (Joseph) and wife; and Samuel aben Pex, none of whom had been taken, as required by law, before the Jewish judge and sentenced. As soon as they were set at liberty the five representatives of the community, D. Çag (Isaac) Maimon, D. Sentó (Shem-Ṭob) Timon, D. Moses Timon (a merchant), D. Moses aben Pex, and R. Abraham Maimon, protested to the governor of the aljama, D. Juan Sanches do Gusman, against the illegal proceeding of the abbot. Together with them appeared the five persons who had been imprisoned, with Moses Gorion and D. Sentó Gabay as witnesses. 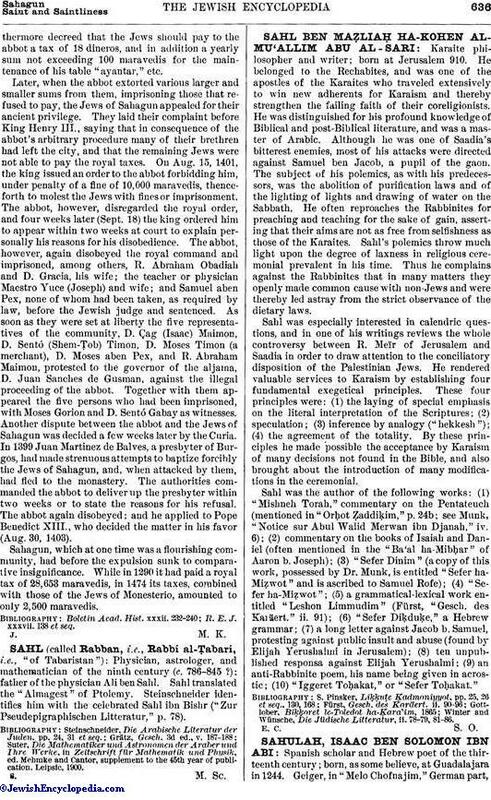 Another dispute between the abbot and the Jews of Sahagun was decided a few weeks later by the Curia. In 1399 Juan Martinez do Balves, a presbyter of Burgos, had made strenuous attempts to baptize forcibly the Jews of Sahagun, and, when attacked by them, had fled to the monastery. The authorities commanded the abbot to deliver up the presbyter within two weeks or to state the reasons for his refusal. The abbot again disobeyed; and he applied to Pope Benedict XIII., who decided the matter in his favor (Aug. 30, 1403). Sahagun, which at one time was a flourishing community, had before the expulsion sunk to comparative insignificance. While in 1290 it had paid a royal tax of 28,653 maravedis, in 1474 its taxes, combined with those of the Jews of Monesterio, amounted to only 2,500 maravedis. R. E. J. xxxvii. 138 et seq.